All of the parts in the fuel system of your Honda small engine are subject to damage by the ethanol in fuel. If your Honda small engine has been stored for a long period of time with fuel still in the system, they may need to be replaced. 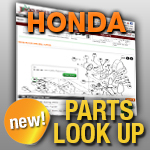 Jacks can provide you with exact replacement Fuel Line and Fuel Joint Assemblies for your Honda small engine.